Now, boys too can wear designers cotton. Your little ones will definitely be the centre of attention being seen in this super cute romper :). Romper in the picture is plain cotton for main fabric and enhanced with cute designer cotton prints on pocket, collar, sleeves, leg bands and the shoulder. 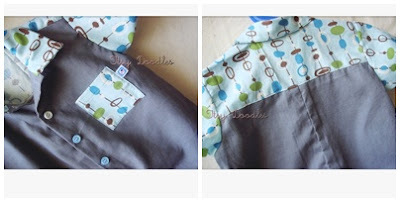 Choices for the main fabric are cotton-linen or kona cotton which are suitable for babies. This romper can also be made in full print. Designer cottons make the cutest romper ever! Price starts from RM 55-00/pair.